[Dovpo Topside 모드]이것은 너희들이 원하는 저가이다. 사진에서 볼 수 있는 것처럼. 쿠폰 코드:DE15, 15% 추가 할인을 받을 수 있습니다. @HWIYAHi,of course this code is available to use,I can't post picture in comment,so i upload it,pls copy the link and open it,you will see it. and free shipping is for everywhere.maybe you need to register and try again. @HWIYAso bro,did you ever try again? i just wonder maybe you use the wrong code,if you are a retailer,you can just use the DE15 code,if you are a wholesaler,you can just use D117 code.The retail code is available to use even you don't register. If you verified your phone number when you register,you will be a wholesaler,pls keep this in mind. so bro,did you ever try again? i just wonder maybe you use the wrong code,if you are a retailer,you can just use the DE15 code,if you are a wholesaler,you can just use D117 code.The retail code is available to use even you don't register. If you verified your phone number when you register,you will be a wholesaler,pls keep this in mind. but shipping price "DHL" 18$ and normal mail is 10$ right ? @HWIYAhope our next promotion will satisfy you. hope our next promotion will satisfy you. @HWIYAthat's ok,hope my explaination won't confuse you. 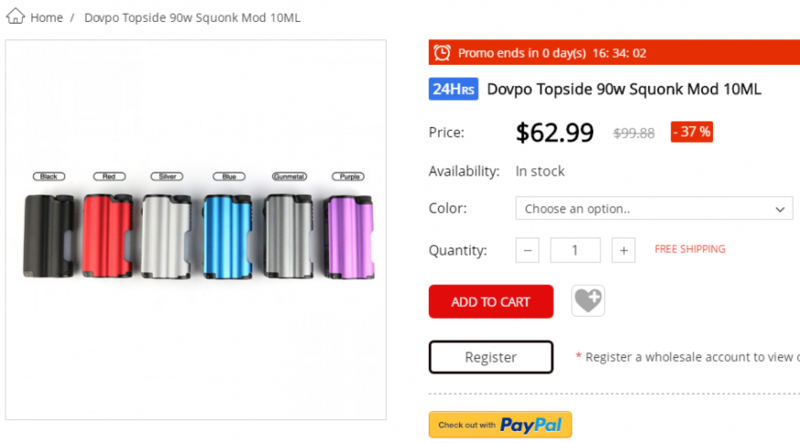 by the way,what do you think of voopoo drag 2,for now you can get 52% of totally. The free shipping reaaly takes longer time to deliver,if you like,you can choose the normal deliver or DHL,Compared with the money saved by the discount, the shipping fee is not hard to accept. that's ok,hope my explaination won't confuse you. by the way,what do you think of voopoo drag 2,for now you can get 52% of totally. The free shipping reaaly takes longer time to deliver,if you like,you can choose the normal deliver or DHL,Compared with the money saved by the discount, the shipping fee is not hard to accept.